The thing about people’s protest marches in Sri Lanka, at least in recent years, is that they are rarely, if not ever, organic. An overwhelming majority of the participating masses, often numbering tens of thousands, are invariably party supporters who either feel obligated to turn up or genuinely enjoy the thrill of it all. In the case of the latter, one can hardly blame their enthusiasm. As anyone who has ever been even a casual observer of these events can probably attest to, there is plenty of fun to be had. The free ride home is just the icing on the cake. Amid much revelling and merrymaking – to a ceaseless background score of live papare music, at that – even if one ignores the prospect of free-flowing alcohol, the cause is all but forgotten, the placards strewn on the ground and trampled on, and the egalitarian slogans and pronouncements replaced by cries of partisan chest-thumping. This is true for the Sri Lanka Podujana Peramuna (SLPP) as it is for the United National Party (UNP). In Sri Lanka, the “people’s march” is and, for a long while, has been little more than a political defecating contest. Call it what you will, but the Arab Spring or Occupy Wallstreet it ain’t. With the possible exception of the UNP’s own Janabalaya march of late 2001, at a time when the economy was in tatters and the average Sirisena (not to be confused with the Head of State of the same name) was really feeling the brunt of it, and the definite exception of the angry commuters who raised hell at the Fort Railway Station last month, one is hard-pressed to recall a recent protest march or rally that rose organically from within the people, from the ground up. Given this reality, one may be forgiven for wondering why media organisations bother dedicating valuable airtime and column inches to hair-splitting post-protest analyses, every single time. After all, if the event being considered was not much more than some political muscle-flexing, what difference does it make how many party supporters and loyalists the organisers were able to mobilise? This is, of course, a rather superficial reading of the situation. The truth is that, more often than not, it does make a difference. Needless to say, optics play an important, if not crucial, role in swaying popular opinion. Questions arise, however, when those entrusted with said analysis, intentionally or otherwise, refuse to shed their partisan lenses when looking at the subject of their inquiry – the 5 September Janabalaya march organised by the SLPP being the most recent example. Much has been said about the effectiveness or lack thereof of this latest exercise in obscene hand-gesturing. But by all [independent] accounts, the so-called ‘people’s force’ was somewhat of a dud; a people’s farce even, if you will. One estimate, rather charitably by its own admission, put the total count somewhere between 50,000 to 87,000 – a far cry from the promised 200,000. If reports appearing on websites said to be affiliated to the organisers themselves are to be believed, the fallout from the PR disaster that ensued will be one to watch out for, particularly in the context of the already-murky path to the Joint Opposition’s nomination for a presidential candidate in 2020. The blame game, it seems, has already begun. However, whether or not the Janabalaya achieved the objectives it had set out to achieve – chief among which had been, evidently, the political coming of age of its apparent architect MP Namal Rajapaksa as opposed to any serious attempt to overthrow the Government, it must be noted that the young Parliamentarian from Hambantota succeeded in generating enough media as well as social media buzz for the protest in the days leading up to 5 September. 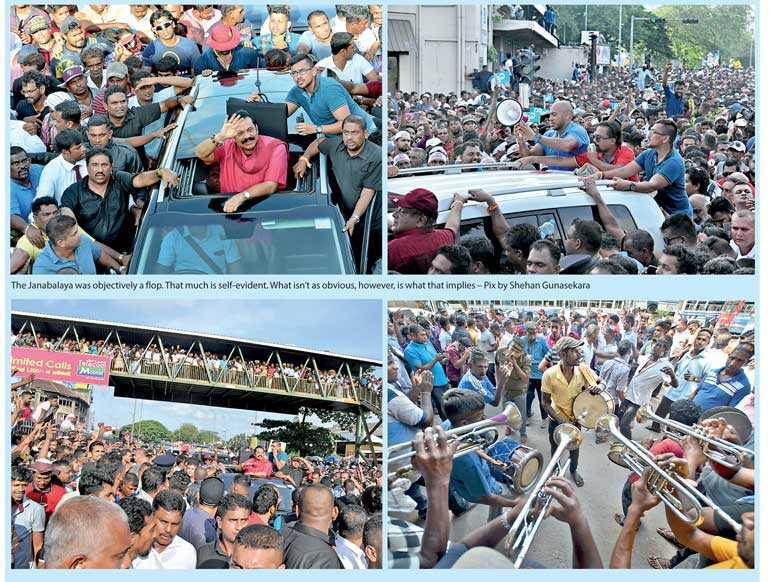 Despite the ultimate failure of the protest proper, Rajapaksa’s ability to capitalise on frustrations directed at the increasingly-unpopular Yahapalana Government in drumming up support for his cause, at least in terms of shallow publicity, is something his critics in both the Government and within his own ranks ought to take note of. Regardless, the project was a clear failure in the end; and there is no getting around the fact that, despite its impressive showing at the last Local Government elections, the SLPP was unable to muster enough support for a sizeable demonstration of strength. The Janabalaya was objectively a flop. That much is self-evident. What isn’t as obvious, however, is what that implies. By now, it is no secret that cracks are appearing in the Joint Opposition. Media reports abound alluding to frustrations within the camp over a number of issues including but not limited to the poor turnout for the protest and the lingering question of who will run for president. However, this sort of development in the wake of a major political miscalculation is not surprising. Some internal finger-pointing is par for the course. And given the uncertain eligibility (legally speaking) of individual Rajapaksa family members for the country’s top job and an alleged friction within the party hierarchy over the same, differences of opinion are to be expected. Tempting though it may be for the UNP, it may prove a costly mistake to count on an implosion of the JO over these alleged differences that may well turn out to be exaggerated. Predictably, it appears the UNP and President Maithripala Sirisena’s faction of the Sri Lanka Freedom Party (SLFP) have read or are in the process of reading the SLPP’s PR “defeat” vis-à-vis the Janabalaya as something more than the temporary setback it is for the still-young party. It was not too long ago that former President Mahinda Rajapaka’s ‘pohottuwa’ created a major electoral upset by securing a landslide victory against the ruling UNP-SLFP coalition, thanks largely to their blunders and broken promises and allegations of large-scale corruption. With the next presidential election just over a year away, the Yahapalana Government can no longer afford to be complacent. The protest march may have been a flop, but that is in no way a guarantee that the SLPP has lost its electoral gains. What little goodwill the Government has been able to generate thanks to the public’s derision of the Janabalaya shenanigans – ably helped by an enduring and rather elitist misreading of the “gal arakku and buth packet” nature of protest politics – may already be eroding due to the UNP’s juvenile promises of a counter march of its own and a possible decision to re-appoint an ousted minister. Such less-than-sensible theatrics are not winning the Government any hearts and minds, to say nothing of the high cost of living and various other issues currently plaguing the country, as well as the somewhat justifiable accusations of sheer incompetence. The Janabalaya was mere party politics, perhaps, but as last month’s anti-railway-worker protest amply demonstrated, the people will not hesitate to take to the streets when pushed hard enough; and when they do, the political vultures hovering above them will be all too happy use it to their advantage and reverse the precious few democratic gains this country has made over the last three years. If the Yahapalana Government is serious about not being party to that nightmarish eventuality, it’s time it took a long, hard look at itself.